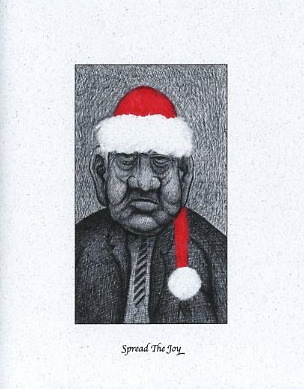 Anderson Studiowork: An ArtBlog: Holiday Cards! The cards measure about 4.5 x 5.5 inches, come with envelopes, and are blank inside. 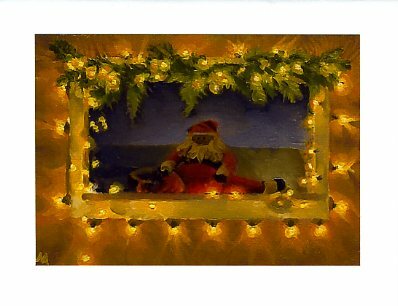 A stuffed Santa doll rests on a window ledge, framed with greenery and basking in the warm glow of yellow lights. From an oil painting, 5 x 7 inches. 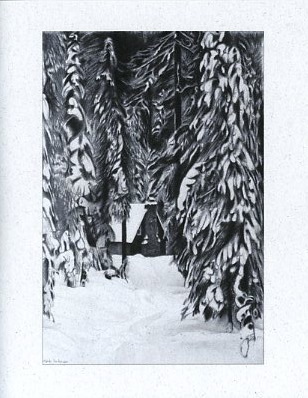 I'd like to spend a week here with my family and friends, skis, paints, and firewood. From a pencil drawing, 18 x 12 inches. 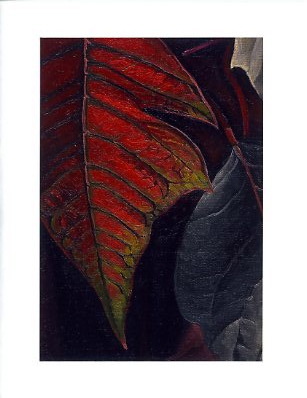 A poinsettia leaf illuminated from behind, like a stained glass window. From an oil painting, 7 x 5 inches. Some people are naturally resistant to this season. It is good to treat them gently. From an ink drawing, 7 x 4 inches. Each color image is ink-jet printed on high-gloss photo paper, then glued to a white, 110 lb. notecard. The two black and white cards are ink-jet printed on "Silver Sparkle" 80 lb. archival notecard stock. This paper gives a subtle snowy effect when light is reflected. See below. Cards are packed and sold in units of 4 of the same image. If you want more than one pack, first click "Add to Cart", then enter the desired quantity in the appropriate box on the form. To save this information you then have to click "Update Cart". You can go back and forth from your cart to my blog, adding and removing items from your cart. To see your cart, click on the "View Cart" button just below the Spread the Joy cards. Orders up to 13 oz (1 to 5 packs): $3.50. Shipping via USPS first class. Orders over 13 ounces (6 packs or more): $5.00. Shipping via USPS priority. Cards and envelopes are carefully packed to prevent damage and shipped in an envelope or small package. According to the USPS website, domestic shipping averages 3 business days. I prefer payment via PayPal, a secure, easy and fast way to make payments using a credit card or bank account. You do not need to have a PayPal account to use PayPal's secure website. If you click on "Add to Cart" under any card, and then "Proceed to Checkout", and finally on the "Continue" link next to "Don't have a PayPal account? ", you'll be able to examine the form. (you can still back out at this point; you're not committed).